Apple's Mid 2017 27-inch iMac 5K line, which was announced on June 5, 2017, received all-new processors and updated graphics. The 27-inch Retina 5K display offers users 5120x2880 resolution with support for one billion colors. The wide color (P3) screen also has a brightness level of 500 nits. Powered by quad-core Intel Core i5 processors starting at 3.4GHz with Turbo Boost up to 3.8GHz, the 27-inch iMac 5K can also be configured with a 4.2GHz quad-core Intel Core i7 processor with Turbo Boost up to 4.5GHz. Memory options start at 8GB (two 4GB sticks) of 2400MHz DDR4 memory with four SO-DIMM, user accessible slots. The systems can also be configured with 16GB, 32GB or 64GB of RAM. Storage options are also numerous starting with a 1TB Fusion Drive and configurable to a 3TB Fusion Drive. SSD options include 256GB, 512GB, 1TB and 2TB. Users can also choose from three graphics cards: Radeon Pro 570 with 4GB of VRAM, Radeon 575 with 4GB of VRAM and Radeon 580 with 8GB of VRAM. 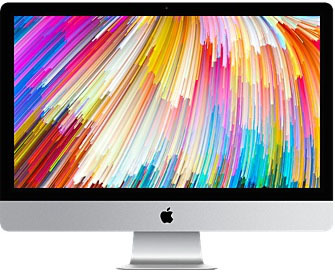 The 2017 27-inch iMac 5K also supports Thunderbolt 3 digital video output. Price with $30 promo code APINSIDER. Adorama will not collect sales tax on orders shipped outside NY and NJ. As always, if you have any issues, you can reach out to us at priceguides@gmail.com and we'll try and help. Price with $25 promo code APINSIDER. As always, if you have any issues, you can reach out to us at priceguides@gmail.com and we'll try and help. Price with $50 coupon code APINSIDER. Adorama will not collect sales tax on orders shipped outside NY and NJ. As always, if you have any issues, you can reach out to us at priceguides@gmail.com and we'll try and help.